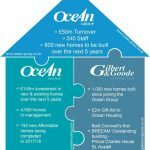 Ocean Housing celebrated the completion of 24 homes at Coburg Terrace and Wheal Concord Way, Blackwater on Tuesday 24th April. 70 homes, 4 schemes, 1 School expansion …and maybe an award – that calls for a coffee! Here's a one page ‘infographic’ with some headline information about the members of the Ocean Group and our collective contribution. Ocean’s Head of Health, Safety and Environment, Ralph Garth, teamed up with Cornwall Fire and Rescue Service and Community Safety team to run a special fire safety session at Park House – to talk to residents, provide reassurance, advice and support.